This contribution addresses the strain capacity of pipelines associated with Strain-Based Design. The strain capacity is investigated for girth welded pipe sections in a large-scale test series where the pipe material has selected heterogeneous strength properties. 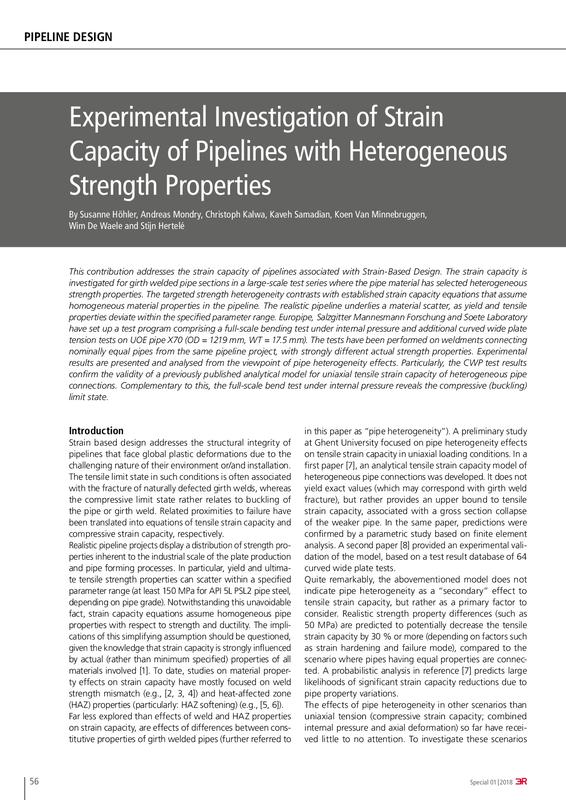 The targeted strength heterogeneity contrasts with established strain capacity equations that assume homogeneous material properties in the pipeline. The realistic pipeline underlies a material scatter, as yield and tensile properties deviate within the specified parameter range. Europipe, Salzgitter Mannesmann Forschung and Soete Laboratory have set up a test program comprising a full-scale bending test under internal pressure and additional curved wide plate tension tests on UOE pipe X70 (OD = 1219 mm, WT = 17.5 mm). The tests have been performed on weldments connecting nominally equal pipes from the same pipeline project, with strongly different actual strength properties. Experimental results are presented and analysed from the viewpoint of pipe heterogeneity effects. Particularly, the CWP test results confirm the validity of a previously published analytical model for uniaxial tensile strain capacity of heterogeneous pipe connections. Complementary to this, the full-scale bend test under internal pressure reveals the compressive (buckling) limit state.